After a long wait I just recieved my beatiful frame from a custom builder. All the bits were exactally as I specified and I was very happy to see all was in place. Upon building it up I noticed a problem; when placing the rear wheel in the horzontal track style drops it seemed something was not right. When the rear hub bolts (a King bolt-on SS ) were slid all the way forward to "bottom-out" in the drops the wheel (which is quite new and perfectly dished and trued) sat unevenly. Typically when "setting" my rear SS wheel in a horizontal track I eyeball the rim/tire, looking from behind, and measure with my eye how much of the BB protrudes from each side of the tire. If I want to get fancier I'll measure the space between the rim and the chainstay on each side. Well, when I slid the wheel all the way forward the wheel set unevenly. The front of the rim leaned off toward the dirve side. Maybe something on the magnitude of an eigth to a quarter of an inch. I wasn't happy about it but I figured it would be no big deal as you'll never be running your hub bottomed out against the front of your horizontal drops. So I pulled back on the wheel and set it in about the middle of the drops and eyed the wheel against the BB and then measured against the rim and the chainstays. OK, centered. But it felt like the drops may have not been perfectly "perpendicular" to each other as when I went to tighten the bolts it wanted to shift the wheel a bit one way or the other depending on which I tightened first. But with just a bit of care it finally set well and was even at the chainstays by ruler and on the BB by my eyeball method. However, the portion of the wheel that passed through the seat stays was obviously tilted to the driveside by about an eight to a quarter of an inch. You can also see the uneveness as the V brake arms close unevenly. I'm guessing the fellow I'm going to have measure up the frame will turn out something like, "yeah, it's off a bit but it shouldn't affect the ride." 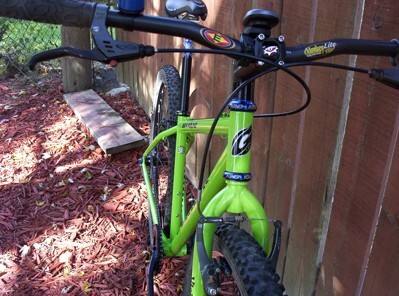 Is this something you could live with after shelling out top dollar for a custom frame? I could live with this on maybe a cheaper Surly or a Soma. (Funny, but I have one of each and both are spot on.) But I'm thinking every time I'm going to have to fiddle with the rear bolts I'll have to monkey around to get the rear wheel dialed in correctly. Perhaps it's too much to ask that the frame be perfect. I know I'm too particular with my gear, but that's why I paid the extra cash to an experience builder who I thought would get the frame 100 percent right. Ummm, have you bothered contacting the builder? Definitely call the builder and see what he says. 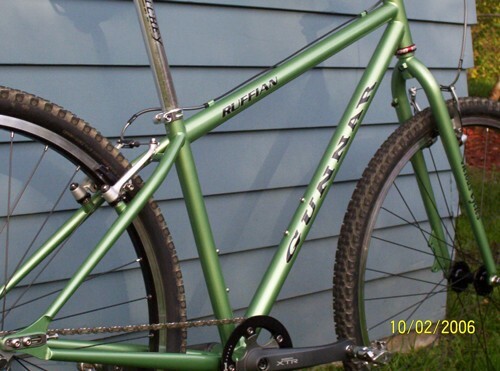 I had a $600 custom steel frame that had a few "errors". I called the builder, he said it will ride fine, and I rode it. If I had paid large sums of money for a frame and received something that wasn't quite right I would be displeased. Thus are the joys of working with a custom builder sometimes. You're working with one guy (or a few guys) that are producing one-off frames instead of tried and true standard sizes. I know what it can be like to wait a long time for a frame to show up to be disappointed and have to make that awkward phone call. I would hate to have to send it back and lose ride time on something I already waited awhile for, but I would be more pissed off every time I looked at the bike or had to adjust the chain tension. You sound like a reasonable guy........contact the builder and nicely point out your concerns. Most custom builders are proud of thier work and would want to know and do something about it. Good luck. If I'd shelled out for a custom, I would want the builder to make it right. And I agree with Gabe about most builders taking a lot of pride in their work. That said, I have a frame (with vert. drops) with a similar problem: I need to run a slightly off-dish wheel to get my tire centered in the chainstays, and then it's still off up at the seatstays. I just use a different stack of washers for the V-brake on either side, so the arms look symmetrical. The frame tracks great, steers no-handed just fine, and I've had no problems using it like this for 9 years. I'm sure every builder cringes when they get that call from a customer with a "concern" about their new "not-so-perfect" frame. Not wanting to come off like an overly particular complainer, I'll try to get some objective numbers from the frame builder I know and present this to the original builder. From another perspecitive, if someone were unhappy with my work I'd most certainly want to know about it asap. Furthermore, I was planning on passing on a significant amount of potential buisiness to this builder but as it stands right now I'm having second thoughts on that prospect. But in the end I'm sure it will all work out just fine. Was the frame shipped to you? Have you checked out the alignment? It might be just a simple dropout alignment to get it where it needs to be. If you are displeased send it back. A custom Geometery frame should the way you were quoted. I my self had two custom frames made and it tolk longer than we thought but both are perfect. I also have a couple Surlys, Ride your old bikes and send the new frame back. A custom frame sound like a deal. Did you get a fork with that?? Both my customs are Gunnars. One geared and one SS with the Paragon Drop outs. I have a good repoor with the guys at Waterford (Gunnar Bikes) and even though my frames were more than $600 I'm Happy. But I'm thinking every time I'm going to have to fiddle with the rear bolts I'll have to monkey around to get the rear wheel dialed in correctly. Perhaps it's too much to ask that the frame be perfect. I know I'm too particular with my gear, but that's why I paid the extra cash to an experience builder who I thought would get the frame 100 percent right. For me, these little quirks are what give a bike personality. If it rides okay, I wouldn't worry about it. You'll soon get a system for setting the rear wheel dialed. I've seen this before. Did you try putting a tire on the wheel (I couldn't tell by your description)? With the one I saw, when the wheel was centered between the chainstays, the tire was really close to one of the seatstays. If that's the case with yours, it's a valid concern and should be discussed with the builder. You see, it's not nearly bad enough to cause wheel clearance issues. That's part of the issue, the misalignment is really not bad at all. If it were it would be a non-issue and the frame would be back to the builder already. The misalignment is pretty slight and that's why I'm going back and forth with it in my head. Well, decide for yourself if it's a big deal or not...before you ride it. If this is going to constantly eat at you, talk to the builder. If you think you can eventually get over it, but later on if bad things happen when you ride it, then definitely talk to the builder. If nothing happens, then it's yours and put it out of your head. I've seen minor quibbles on even uber-expensive frames, but they ride right...and the performance is not affected in any way. I would find somebody with a set of park or campy dropout gauges, the kind that bolt into each side, then line up at hub center, and see how straight or un-straight the frame is. They're pretty long too, so they make it easy to make slight cold set adjustments to get it back to straight if it's out a little. If it's out more than a little, I'd touch base with the builder. This post is in 3B, three beers and it looks good eh! I have had a hell of alot of bikes in my 19 or so years of riding, anyway i have found that there seems to be more imperfections in the more expensive frames,some by very reputable companys than with production stuff.I shy away from spending alot of money on a frame now.I dont think it is any coincidence that so many frames are produced over seas now,even companys that were loyal to made in usa or so on.These guys that produce more frames day in day out get alot of practice.The last custom frame i bought which cost three times the price of most of my other bikes was to be honest a bloody joke . You are certainly being reasonable to expect your custom frame to be perfect. The whole point of using a custom builder is his attention to detail which production builders cannot give. Check with your friend to make sure there actually is a problem. Then give your builder a call - you'll soon find out what he is made of. A good builder will want to correct it because he takes pride in his work and he knows satisfied customers are his best advertising. Either way, let us know who this guy is and how he handles your concerns. I've talked to a local builder to whom I give a lot of business and he's going to check it out for me. Good luck to ya. That bike aint right. I he says it off by a little, even if it might ride fine, send it back. It will eat at you. You will never feel right about the bike. I had a $800 custom frame made. The welds were okay, the paint was okay, the bike rode well, but I had a bit of oe overlap. I rode it for 8 months, compensating with my cleats. I'm done with it now. It will EAT at you. Send it back. I have to admit that I really like the Paul horizontal drops with the little finger screws... It is pretty typical to be focused on the drive side when wrenching your wheel on (getting the chain tension juuuust riiight). The result is the non-drive side slips forward in the drop when you wrench the drive side bolt. The little Paul bolts make sure that your drive side has the chain tension you want and the non-drive side doesn't slip forward when wrenching. Extra fiddling when changing a wheel? Yes... Nice to have? Yes. Well I took the frame to a friend of mine who is a very reputable builder and he measured it up. The rear triangle is off. The drive side drop out is lower than the other enough to tilt the wheel clockwise (looking at the wheel from behind). The top of the wheel is shifted to the drive side chainstay by about 1/4". I asked him if he felt this was "acceptable" and he was pretty clear that is was not. He said maybe for a $250 budget frame but not for a $1000 plus frame. Hey, it happens but at least now I know exactally what the problem is and can communicate this to the builder clearly. I'm confident he will take care of the problem. Too bad though, as I had planned on having the frame built up for a biking trip down south in March. The builder I took it too showed me where the problem was likely from. The drive side seat stay appears to be welded to the seat tube just slightly lower than the other stay. That's what pushed the drive side dropout lower than the other. I asked him if there was an easy fix, such as simply rewelding the the stays in correct alignment. He told me probably not if it was made from higher grade air hardened steel. Seems like the the frame will need to be scrapped and completely rebuilt. Any comments on this? Last edited by Miker J; 02-23-2007 at 03:32 PM. The builder I took it too showed me where the problem was likely from. The drive side chainstay appears to be welded to the seat tube just slightly lower than the other stay. That's what pushed the drive side dropout lower than the other. I asked him if there was an easy fix, such as simply rewelding the the stays in correct alignment. He told me probably not if it was made from higher grade air hardened steel. Seems like the the frame will need to be scrapped and completely rebuilt. Any comments on this? Do you mean the seatstay is low on the seat tube? The Chainstays are attached to the BB shell (unless you had a elevated chainstay design built). It may be possible for the builder to just replace all or part of the rear triangle. Depends on the material and the builder--his choice. Mental error. Should be seat stay. I had a similar issue with a seatstay that was obviously off a bit. There was no problem with wheel alignment. I've got miles of smiles on the bike now, but even something that's purely cosmetic sure takes some air out of the "Oh boy, my new bike is here" balloon. Your situation sounds more serious. How something of that magnitude could make it out the door is beyond me. The builder needs to make it right.